ï»¿ Data Quest Synergy Sdn. Bhd. DATA QUEST SYNERGY SDN. BHD. 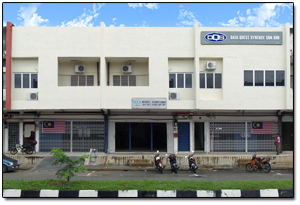 (DQS) was incorporated on the 31st December 2002 under the Akta Syarikat 1965. DQS is a wholly owned Bumiputra company staffed by a mixture of enterprising & dedicated Ex-RMN personnel and young engineers. The company is registered with the Ministry Of Finance to do businesses on information technology, general trading and weapon systems. Clientele base for the company includes Government and Quasi-Government organizations and Private establishments. In the field of general trading, DQS enjoys the support of a number of Local and Overseas Principals who have world leading products within their respective technology areas with the expertise and the resources to satisfy the logistical requirements of its clientele. Provision of quality products at competitive prices at the shortest delivery time is always a matter of utmost priority to the company. DQS as Representative of Lockheed Martin Sippican, Inc. USA, is the exclusive supplier of the ALEX Decoy Launch System (shipboard countermeasure system) for Malaysia. The range of products covers the decoy launch systems, decoy cartridges and elements of the Integrated Logistic Support (ILS). In the field of naval gun system engineering, DQS is the sole representative for MSI Defence Systems Ltd. U.K. for Malaysia. Apart from the MSI family of SEAHAWK Naval Gun Systems, range of MSI products amongst others includes the Target Designation Sight (TDS) and SPL A10 Plotting Table. DQS is authorized for the provision of spareparts, maintenance and repair of MSI DS30 naval gun systems. The DQS weapon maintenance workshop (located in Sri Manjung, Perak) is in close proximity to the RMN Naval Base in Lumut. Staffed by experienced and trained personnel, DQS is able to render services at short notices whenever required. For both ALEX Decoy Launch System and MSI naval gun systems, DQS is the Authorised Service Center and has trained personnel capable of carrying out activities such as installation of equipment on board ship, setting to work, harbour acceptance trial, system integration test, sea acceptance trial, live firing trials and through life product support. Having in-depth knowledge of RMN logistical requirement and processes of material procurement, as well as maintenance requirement of weapon systems, DQS is able to complement its Principals in an effective team effort to ensure a high level of operational availability for the weapon systems in the fleet. DQS Management and Staffs place high emphasis in providing an efficient, quality service at a competitive price to the customers. Copyright 2011 Data Quest Synergy Sdn. Bhd.